The Myers-Briggs Type Indicator (MBTI) is the world’s most scientifically verified personality test, given to millions of people worldwide. 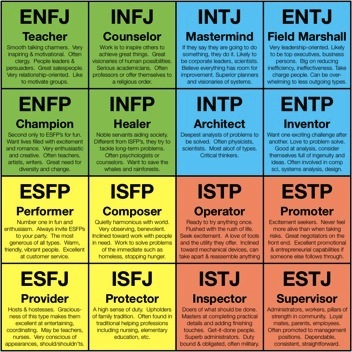 For more than 20 years, Lawrimore Inc. has provided Myers-Briggs testing as part of our organization development and management consulting services. Now we are pleased to also offer a low-cost version which you can take online any time, any where. This new service is made possible by an affiliation with Truity.com, which provides an Internet version of the Myers-Briggs called The TypeFinder® Personality Test. It is not identical to the Myers-Briggs but provides a quick and easy assessment for each participant to learn their 4-letter Myers-Briggs type. (Full disclosure: This is an affiliate link for which we receive a commission from purchases.) You can check out the TypeFinder® Personality Test here. Lawrimore Inc. also offers the official, original, full, paper and pencil version of the Myers-Briggs Type Indicator, which we consider more accurate than any other version. It provides numeric scores for each of the 4 personality scales which we find valuable because it matters whether someone has a slight or extreme preference for one or more of the scales. We provide this in-depth version for $50-100 per person depending on the number who take it at one time and whether the results are presented individually or in a group setting. In fact people working together – or married – can have opposite personality types, which can cause no end of friction, split-ups and divorces. With professional counseling they can understand each other’s natural differences and learn to get along better and even complement each other better. It is widely believed that each person’s Myers-Briggs type is based on his or her own genetic make-up. We are born with a strong disposition to have a certain personality type, and even though life experiences can make us lean one way or the other, the true personality type changes very little over an entire lifetime. You are much better off knowing your true personality type, and building a life and a job that is consistent with that, than trying to satisfy other people’s ideas of what you ought to be and making yourself miserable in the process. So whether you want to understand yourself better, your team or company, your spouse or children, contact Lawrimore Inc. today to learn more about the Myers-Briggs and which version is right for you.